KPIs have been around in SSRS in some fashion for most releases. Row level indicators and gauges were added in 2008 R2, but even before that, you could roll-your-own KPIs with images and a small amount of custom code. KPI stands for key performance indicator. They allow a business user or executive to see important metrics with just a glance. They convey the information with numbers, colors, and shapes. Starting with 2016, you now have another KPI option. KPIs can be added directly to the web portal. They are also supported on mobile devices with the PowerBI app. The report user will see the KPIs information directly on the web portal page without needing to run it. The figure below shows a KPI that includes a trend line. A trend line could represent the values for each month that make up the number shown for example. Another interesting difference is how they are developed. They are developed directly within the web portal. You don’t use a separate tool like Report Builder or Mobile Report Publisher. 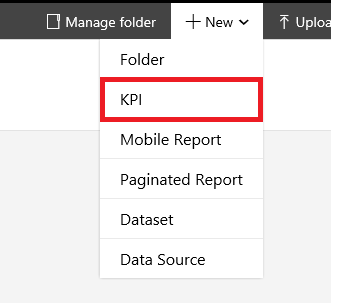 To create a new KPI, you must have permission to publish reports within a folder. When you have that permission, you will see the New menu. Click New -> KPI to launch the designer. When the KPI is created, it is loaded with simulated data. That will give you a chance to see how the KPI will look and to understand which datatypes you will need in your dataset. There are four data items to configure: Value, Goal, Status, and Trend set. You can connect each data item to a shared dataset. This can be the same dataset for all, or it can be different datasets for each. 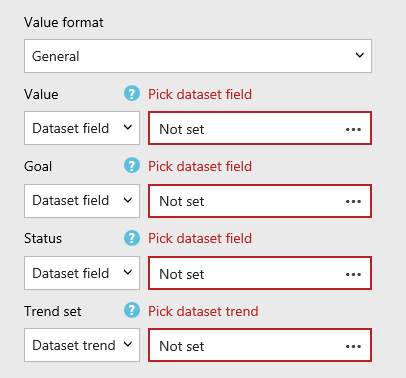 To connect to the dataset, change the data item to Dataset Field or Dataset Trend in the case of the Trend set. Click the ellipsis next to one of the data fields to navigate to one of the shared datasets. Note that only shared datasets will work with KPIs. Select the column to use and choose one of several aggregation functions. The Value and Goal data items must connect to a number. The Status must connect to a column in a dataset that returns 1, 0, or -1. The color of the KPI background is determined by the status, 1 for green, 0 for yellow, and -1 for red. The Trend is not aggregated. Fill in a name and optional description. If you are using a Trend set, select the Visualization. The Related content property allows you to click through to a Mobile Report or a custom URL. If you have Service Pack 1 applied, you can also select the Direct navigation property for custom URLs. 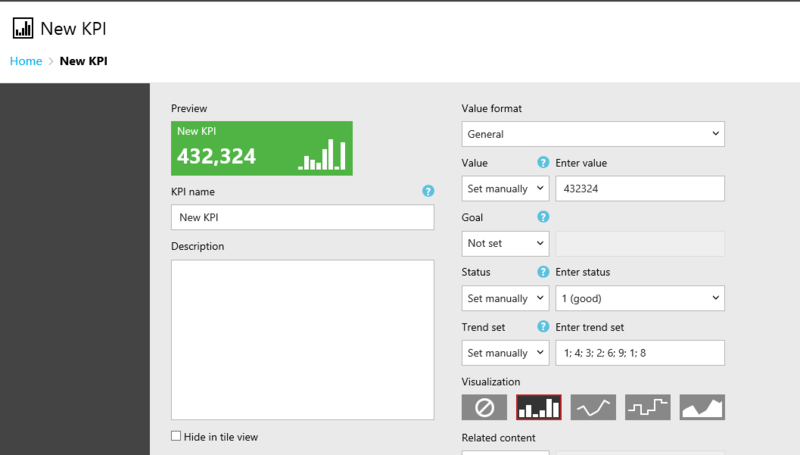 The new KPI feature is easy to configure, and should be useful for many companies. Now that you know how to configure KPI reports, the next post will tell you what you need to know to keep the data up to date. 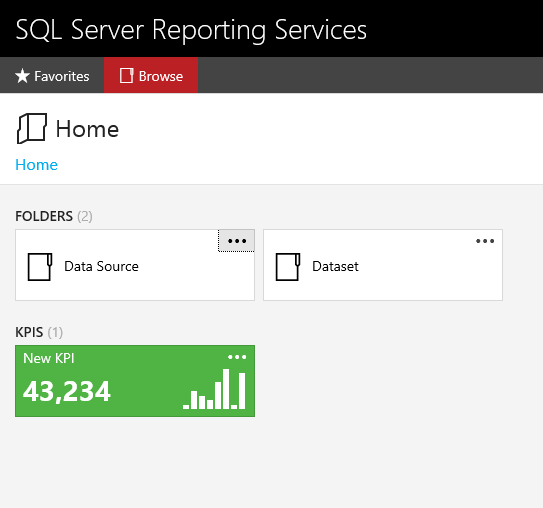 2 Responses to What are SSRS 2016 KPI Reports?